The bayfront LEED Silver-rated Argyros Girl Scout Leadership Center is located within Marina Park, a unique public marine recreational facility on 10.5 acres on Balboa Peninsula. 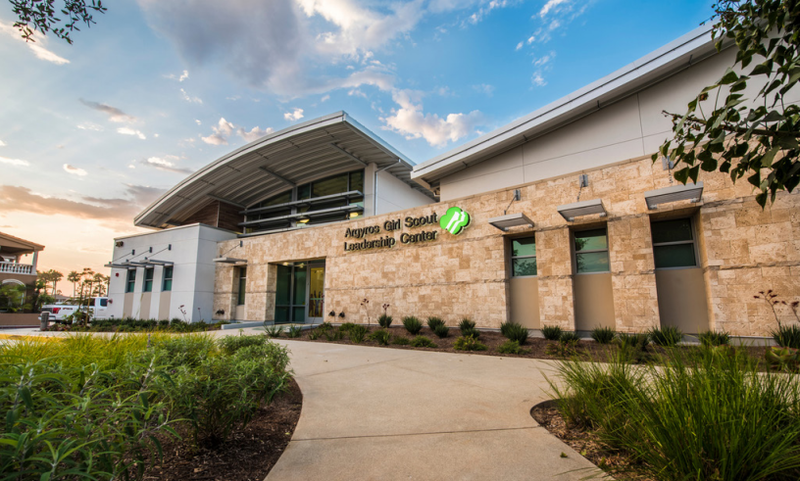 The new one-story 6,100 sf Girl Scout Leadership Center is situated on a tight infill space that has been fully integrated within the Marina Park development. The building was designed to minimize impacts to the surrounding park and adjacent marine environment. The Center, named after George and Julia Argyros of Newport Beach replaces the Neva B. Thomas Girl Scout Program Center that had been located on the peninsula since 1949. The building includes a 2,000 sf S’mores patio, complete with gas fire ring and an adjacent parking lot. The new Center’s educational / multi-media programming focuses on future careers in the STEM (Science, Technology, Engineering and Math) fields. The Center features a central atrium, large educational spaces, full kitchen, showers, bathrooms and dressing area. In addition to education, the Center will also offer kayaking and sailing programs. The Girl Scouts have a 50-year lease on the city-owned land at $1.00 per year. The bayfront Argyros Girl Scout Leadership Center is on the leading edge of recreation and sustainability. The Fuscoe team designed engineering plans as well as both topographic and hydrographic surveys for the Girl Scout Center as well as the entire Marina Park site. Project objectives included an emphasis on water quality and minimizing impacts to the aquatic environment. The parking lot is constructed of cool paving material, to reduce the site’s heat island effect. Drainage was complicated by the site’s proximity to the ocean and utilized LID infiltration technology in lieu of traditional piping. Bioswales / infiltration swales were created at the building’s perimeter and the design ensures that no direct water runoff from either the building or parking lot is directed to the existing storm drain; instead the water is infiltrated into Balboa Peninsula, which acts as a giant sand filter. Additional, Marina Park, including the Girl Scout Center site, is in a California Coastal zone with intensive requirements from multiple agencies, including the California Coastal Commission, US Army Corps of Engineers, Departments of Wildlife and Fish and Game, Regional Water Quality Control Board and others, necessitating a zone change and special permit approvals regarding water quality and marine habitat. SPECIAL RELATIONSHIPS: The Marina Park/Argyros Girl Scout Leadership Center site required intensive coordination with the State of California regarding lease line issues, California Coastal Commission for approvals and all stakeholders, including the City of Newport Beach, Girl Scouts of Orange County, Bundy-Finkel for architecture, Rabben/Herman landscape architects and Perera Construction & Design for construction. OBSTACLES OVERCOME: Project challenges included ensuring water quality and minimizing impacts to the park and aquatic environments, and obtaining California Coastal Commission approval. The bayfront LEED Silver-rated Argyros Girl Scout Leadership Center is on the leading edge of recreation and sustainability. The project is located on a tight infill space within Marina Park, a unique public marine recreational facility on 10.5 acres on Balboa Peninsula. The new one-story 6,100 sf Girl Scout Center has been fully integrated within the Marina Park development and was designed to enhance the surrounding park and adjacent marine environment with beneficial LID features. The Center, named after George and Julia Argyros of Newport Beach, replaces the Neva B. Thomas Girl Scout Program Center that had been located on the peninsula since 1949. The building includes a 2,000 sf S’mores patio, complete with gas fire ring and an adjacent parking lot. The new Center’s educational / multi-media programming focuses on future careers in the STEM (Science, Technology, Engineering and Math) fields. The Center features a central atrium, large educational spaces, full kitchen, showers, bathrooms and dressing area. In addition to education, the Center will also offer kayaking and sailing programs. The Girl Scouts have a 50-year lease on the city-owned land at $1.00 per year. The oceanfront Argyros Girl Scout Leadership Center is on the leading edge of recreation and sustainability. The Fuscoe team designed engineering plans as well as both topographic and hydrographic surveys for the Girl Scout Center as well as the entire Marina Park site. Project objectives included an emphasis on water quality and minimizing impacts to the aquatic environment. The parking lot is constructed of cool paving material, to reduce the site’s heat island effect. Drainage was complicated by the site’s proximity to the ocean and utilized LID infiltration technology in lieu of traditional piping. Bioswales / infiltration swales were created at the building’s perimeter and the design ensures that no direct water runoff from either the building or parking lot is directed to the existing storm drain; instead the water is infiltrated into Balboa Peninsula, which acts as a giant sand filter.